On July 4, 1776, the 13 colonies came together to declare their independence and form what eventually became the United States of America. Every year, Americans celebrate the birth of our nation on this historic day. Between the flags and fireworks, the barbecues and beach time, don’t forget to take a few moments to learn about the most patriotic day of the year. 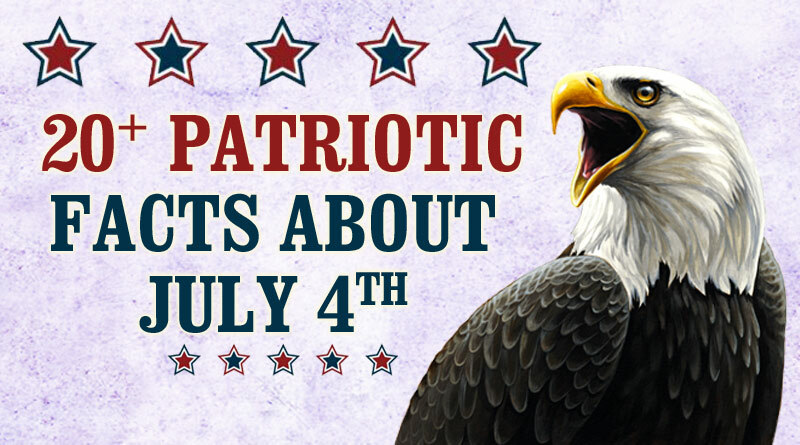 Read through these 20+ Fourth of July facts that will make your patriotism explode like the fireworks soon to pepper the night sky. Feel free to pass along these factoids to friends and family to show just how much you love freedom. 1. The Declaration of Independence was a justification for a revolt against the British which included a list of charges against the British King George III. The grievances included forced housing of military personnel, taxation without legislative consent, and the refusal to enforce and pass laws. 2. The declaration was initially adopted on July 2, but the final, revised version was officially adopted on the 4th. Only two people signed it that day, the president of Congress, John Hancock, and the secretary, Charles Thompson. The rest of the 56 delegates signed it on August 2, 1776. 3. The average age of those who signed the Declaration of Independence was 45. Thomas Lynch, Jr of South Carolina was the youngest at 27 and Benjamin Franklin of Pennsylvania was the oldest at age 70. The author, Thomas Jefferson of West Virginia was 33. 4. The first Independence Day celebration was in 1777, however it wasn’t given that name until 1791. 5. Congress declared July 4th as an official federal holiday in 1870 as part of a bill that also recognized Christmas, New Years and Thanksgiving. 6. Then, in 1938, Congress reaffirmed the holiday to ensure all federal workers received full pay. 7. There is an official “Fourth of July City.” Congress gave the honor to Seward, Nebraska, in 1979. While the population of this small town is only around 6000, more than 40000 come to see the celebration each year. 12. Out of more than 14,000 shows across the country, the largest fireworks display belongs to Macy’s in New York City. Although, cities like Nashville have been looking to take the title for themselves. 13. 10,500 people were injured by fireworks in 2014, according to the Consumer Product Safety Commission. Fireworks safety is of the utmost importance as nearly a dozen people died that year due to firework related incidents. 14. According to the Census Bureau, China provides the U.S. with most of the fireworks. In 2014, almost 96% of the fireworks imported to America come from China. That’s $247.1 million out of the total $257.8 million spent on fireworks. 15. Let’s take this on the road! Nearly 42 Million people travel at least 50 miles on the Fourth. 16. The National Hot Dog and Sausage Council estimate 150 million hot dogs will be eaten on July 4th. That’s enough to stretch from Washington DC to Los Angeles more than FIVE times. 18. …and $167 million on watermelon. 19. Over the holiday weekend, more than 68 million cases of beer will be sold, and more than 103 million Americans will drink beer on the holiday itself. 20. 1 out of every 3 hotdogs produced in America come from Iowa. 21. The Nathan’s Hot Dog Eating Contest held on Coney Island, New York, is said to have originated in 1916. According to legend, four immigrants held a contest the first year to determine who was most patriotic. No evidence of the contest exists yet it is widely attributed as the inaugural contest. 21. In recent years, the has become a staple of the holiday. This is largely due to the spectacle of the competition between Joey Chestnut and Kobayashi in the 2000s. 23. Chestnut captured the record for most hotdogs eaten at the main Fourth of July competition when he ate 70 in 2016. He also holds the overall world record for eating 73.5 hotdogs in a 2016 qualifying event.